From Huichin, Ohlone Territories, in what is now also called Berkeley, California, we ask for your help. The oldest of the San Francisco/Bay Area Shellmounds- the West Berkeley Shellmound and village site- is threatened with destruction. Native people lived in this sacred place for over five thousand years and it continues to be an important landmark for the Ohlone, the Indigenous people of the San Francisco Bay Area. Shellmounds are the monuments that the Native inhabitants created by piling shells, bones, ashes, stones, and earth several stories high; most shellmounds were 300 to 400 feet horizontally and could be seen for miles. Around them people lived, ate, held ceremonies, raised families, buried their loved ones, and spoke to their ancestors for thousands of years. 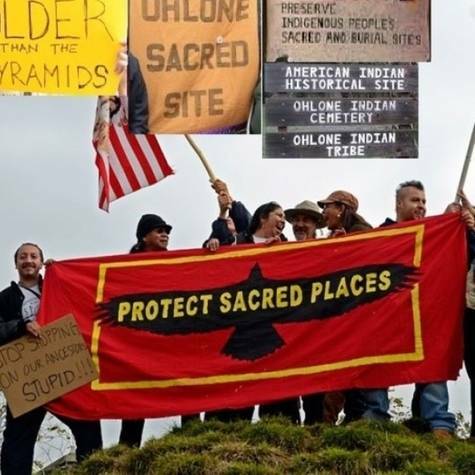 The shellmounds have been leveled by a few hundred years of occupation on Ohlone lands by non-native peoples. But as recent burials found across the street attest, remains of the West Berkeley Shellmound and site are still buried in the earth. A real estate developer currently wants to excavate this sacred land to build a shopping mall and five-story apartment complex. Despite its adoption of the UN Declaration on the Rights of Indigenous Peoples last year, the City of Berkeley is poised to accept the developers’ Environmental Impact Report that completely failed to include adequate consultation with concerned members of the Ohlone community. Please join us to demand that the voices of local Indigenous people be respected when it comes to the protection of their sacred sites!